Yeah, it was hard to deal with emotionally after that. It felt like something had been taken out of me. It had been cut out of my world with sharp surgical precision. Something that I wanted, a child to validate my existence in this world. A chance to leave something of myself behind to continue on after I am gone. Instead, all that hope, all that expectation of happiness, the excitement of having a new life, which was a part of you, brought into the world, was gone. The anticipation of having a child of our own to watch grow up, to raise up the right way, and be proud of had exploded. At work, they told me to take as much time as I need. I didn't need any time off, because that would just make things worse. The last thing I needed was to stay in our little dorm room, having a misery contest with my wife. I needed to be doing something, even if it was just sitting at the computer surfing the net. That didn't help much though. Sometimes I sat at my desk, or at the computer, and started crying for no reason. I wasn't even aware that I was hurting until it just bubbled out of me, like one of those little volcanoes kids make for science projects. I was trying to be strong for her, and support her, because I knew as bad as it was for me, it was worse for her. This was what she thought was a new life miraculously growing inside her. When it didn't, I knew she felt that her womb, her body, her being was somehow at fault. That's why she would suddenly blurt out she was sorry, and start crying. Then I would hold her, and we would both cry. I did my best to reassure her. We were both obviously very fertile. We would have another baby, no problem. Next time there would be no problem. We would go back to Dr. Jaya, get a full blood work up, and see if we could find out what caused the problem. Despite my best efforts to comfort her, I could see she still thought it was ll her fault. I almost had to yell at her to get her to stop suddenly apologizing for no reason, sitting with her and holding her hands and saying 'stop it, there's nothing you did or could do to change things'. finally she did stop saying these things, although I could still see she felt some guilt about it. We went to get the blood test. She was scared, because she was afraid it was going to show some serious incurable infectious disease that we would both die from. Sometimes my wife is an optimist, just like I am. A few days later, the results came back. We got a surprise. Yes, there were a few conditions indicated, but none we were going to die from. The surprise was that she had Rubella (German Measles). In the good old USA, you get vaccinated as a kid for such things. But if you are from a poor family in the Philippines, the government and schools aren't so careful about what shots you get. If you don't get a vaccination for a certain thing, it's probably because the money for the shot went into someones pocket instead of buying the medicine. That's the way things are there- screw you and go to hell so I can live a nice corrupt life. Killing your own and putting them in misery so that you can live as a big shot. There was more than just Rubella. There was also two types of non-sexually transmitted herpes indicated, and Cytomegalovirus. It s seems that you can get CMV from babies, and even though my wife loves to hold and coo over any baby she sees, it is just as likely that I was the one that gave it to her. It's possible that I got infected while working at the orphanage in China, what with 26 cute and active (and possibly CMV infected) kids climbing all over me. So the doctor prescribed some pretty strong antiviral medication. We were told not to get pregnant while taking it, as it causes neural tube defects. Well, we were careful, except for one night when we got carried away . 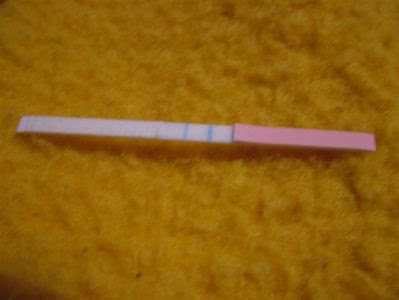 . .
Well, a couple weeks later she started feeling nauseous, and showing all the signs of being pregnant. We knew what that meant, and we didn't want it to be true. Another visit to Dr. Jaya confirmed that it was true. It was a completely normal pregnancy, and the baby was there and developing normally. All signs looked good. My wife would probably carry the baby to term, and have a normal delivery. Yet there was a big risk that the baby was abnormal. Sure, maybe it was normal, but it wasn't likely. More than likely, the baby would be born retarded, or with severe problems. Or my wife would deliver the baby, only to have it die a couple weeks later. If only it had happened a few days later . . . So this time it was no surprise, and we went in for another DNC. This time it was easier for my wife, as she had been through it before. A simple outpatient procedure, and in a couple hours she was resting at home, her loving husband doing his best to pamper her and look after her. This time there were no tears. We had cried ourselves out the first time. This time, we were numb.